) of the biofilm extracts was measured. All experiments were done in triplicate and repeated at least three times, and wells containing uninoculated TSB (blank) were included. The cut-off OD value (ODc) used to differentiate biofilm-producer and non-producer isolates was defined as three standard deviations above the mean OD of the blank . Isolates with OD≤ODc were considered as non-producers. The result of the OD average of biofilm extract was used to classify the isolates as weak producer (ODc<OD≤2xODc), moderate producer (2xODc<OD≤4xODc) and strong biofilm producer (4xODc<OD) . The original composition of Congo Red Agar (CRA)  was modified, having been the medium prepared without sucrose. This medium was also prepared with the addition of rifampicin in concentrations equivalent to MIC/2 and MIC/4 obtained in broth microdilution method. The plates were seeded with 10 µL of overnight TSB cultures by spot plate technique, incubated aerobically for 24 h at 35°C and left overnight at room temperature. With this modification, the reaction was considered positive if the spots had dry crystalline consistency (rough), and negative if they had smooth appearance.The tests were performed in triplicate and repeated three times. The chemical nature of the biofilm matrix produced in the presence of rifampicin was determined by degradation with 40 mM sodium metaperiodate (Vetec, Brazil) or 1 mg/mL proteinase K (Sigma, USA) solutions in 0.1 M PBS (pH7.0), in a test resembling MTP biofilm assay . The isolates were grown overnight in the TSB at 35ºC, diluted 1:100 in the TSB without and with drug (MIC/2 and MIC/4). Then, microtiter plates were seeded with 200 µL per well of the bacterial suspensions and incubated at 350C for 24 hours. Subsequently, the cultures were removed and the wells washed with purified water. Degrading agents and PBS (control), 200 μL per well, were put in triplicate wells and the plates incubated for 2 h at 35ºC. Following, the wells were washed twice with distilled water, and the next steps were developed as described in MTP biofilm assay. A reduction over 50% in OD average, when compared to the control, of wells treated with degrading agents, indicated the chemical nature of the biofilm. Bacterial suspensions were prepared in ultrapure water with colonies grown in Tryptone Soya Agar (TSA - HiMedia, Mumbai, India) and cells lysed by boiling the suspension for 5 min, followed by thermal shock and centrifugation at 12.000xg for 5 min . Supernatants were used as DNA template in a multiplex Polymerase Chain Reaction (PCR) for icaA and icaD genes detection. PCR reactions were performed with Taq DNA Polymerase Master Mix Red (Ampliqon A/S, Denmark), according to the manufacturer’s directions, in a LifePro Thermal Cycler (Hangzhou Bioer Technology Co.). For the detection of icaA gene, the primers were as follows: ica9-TCGCACTCTTATTGATAGTCGCTACGAG and ica10-TGCGACAAGAACTACTGCTGCGTTAAT . The primers for icaD were designed from published sequence of the icaD locus of S. aureus ATCC 25923 in GenBank (acession number CP009361.1) using PrimerBLAST (http://www.ncbi.nlm.nih.gov/tools/primer-blast/): icaD1-TGGTCAAGCCCAGACAGAGGG and icaD2-TCGCGAAAATGCCCATAGTTTCA. The amplified products were analyzed by agarose (1.5%) gel electrophoresis with GelRed™ and visualized using UV light. Their sizes were estimated by comparison with 100bp DNA ladder (Invitrogen - Life Technologies, Canada). After screening for antimicrobial susceptibility and biofilm production 5 clinical (C10, C12, C39, C40 and C50) and 5 non-clinical isolates (H01, H03, H39, H43 and H56) of S. aureus were chosen. H56 isolate was classified as strong biofilm producer, and C39 as a weak producer. The other isolates were classified as non-producers. Among the non-clinical isolates, H43 was beta-lactamase positive and H56 was resistant to erythromycin and beta-lactamase positive. H01 isolate showed resistance to benzyl penicillin and oxacillin, and it was positive in cefoxitin disk screen test, being phenotypically characterized as community-associated meticillin-resistant S. aureus (CA-MRSA). The clinical isolates were positive for beta-lactamase and susceptible to other drugs tested. Sub-MICs of rifampicin induced high biofilm production in seven S. aureus strains (three non-clinical and four clinical), that were biofilm non-producers in TSB. 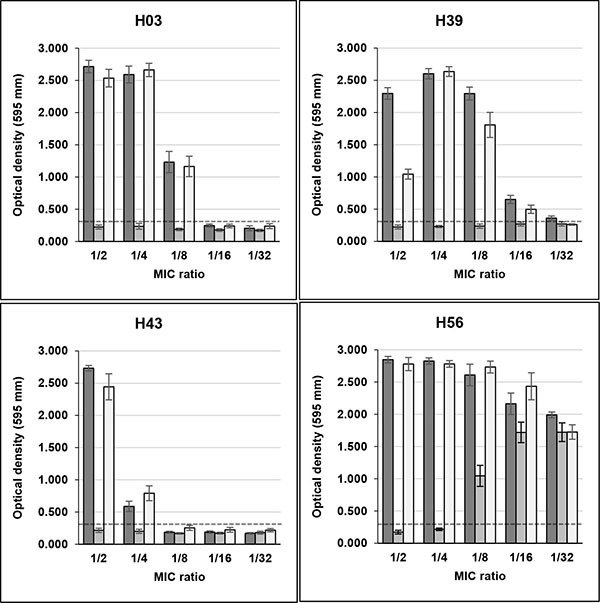 Three non-clinical isolates (H03, H39 and H43) showed OD595 values, respectively, of 2.715, 2.296 and 2.733 in the presence of MIC/2, and 2.590, 2.602 and 0.587 in MIC/4, with control values ranging from 0.161 to 0.261 Fig. (1). H01 isolate remained as non-producer when growing with sub-MICs of the drug (data not shown), and H56 isolate, previously characterized as strong producer, showed increase of OD595 values from 1.486 in control without drug to approximately 2.800 in MIC/2 and MIC/4. The same effect of high biofilm induction was observed in four clinical biofilm non-producer isolates (C10, C12, C40 and C50) in the presence of Sub-MICs of rifampicin. In MIC/2, the OD595 values for these isolates were, respectively, 1.165, 2.076, 2.684 and 2.411 and in MIC/4 0.878, 2.317, 2.629 and 2.436, with control values ranging from 0.205 to 0.243 (Fig. 2). C39 isolate maintained its weak biofilm production in the presence of sub-MICs of this drug (data not shown). Unlike rifampicin, sub-MICs of minocycline did not induced biofilm production in clinical and non-clinical isolates that were previously classified as non-producers in TSB Figs. (1 and 2). Instead, MIC/2 and MIC/4 of minocycline inhibited biofilm production of H56 and C39 isolates, strong and weak biofilm producers, respectively. Fig. (1). Biofilm production in microtitre plate assay by community carriage isolates of S.aureus in TSB added of sub-inhibitory concentrations of rifampin, minocycline and rifampin+ minocycline. Dashed line indicates the cut-off OD (ODc) value. Average value of OD of control culture without drug: H03, H39 and H43 < 0.300; H56=1.554. The effect of rifampicin in combination with minocycline on biofilm production in clinical and non-clinical isolates was similar to that detected with rifampicin alone for almost all strains tested. 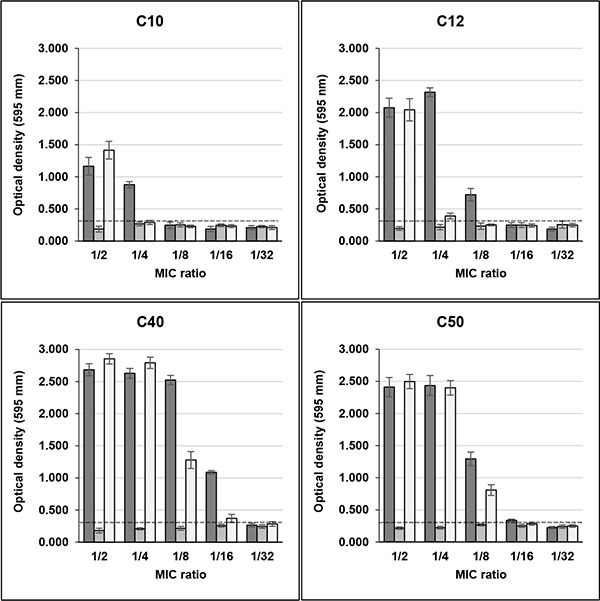 However, the drugs in combination induced biofilm production in C10 isolate only in MIC/2, while for C12 isolate induction in MIC/4 was much lower than that of rifampicin alone (Fig. 2). Fig. (2). Biofilm production in microtitre plate assay by clinical isolates of S.aureus in TSB added of sub-inhibitory concentrations of rifampin, minocycline and rifampin+ minocycline. Dashed line indicates the cut-off OD (ODc) value. Average value of OD of control culture without drug: C10, C12, C40 and C50 < 0.300. With the exception of biofilm non-producer H01, which showed negative reaction in both media (modified CRA without and with rifampicin), all isolates classified as biofilm non-producers in MTP assay showed negative reaction in modified CRA and were positive in modified CRA with rifampicin. The strong producer H56 isolate showed positive reaction in both media, while the weak producer C39 isolate showed negative results (Figs. 3 and 4). Fig. (3). Clinical isolates of S. aureus growing in modified CRA (without sucrose) [A] and modified CRA containing sub-MICs of rifampicin (0.002 or 0.004 µg/mL) [B]. Identification of the isolates: C10, C12, C39, C40 and C50. Biofilm negative: spots with smooth appearance. Biofilm positive: spots with rough appearance. The chemical nature of the biofilm produced by the isolates was determined by MTP biofilm detachment assay. The biofilm producer strains H56 and C39 maintained their biofilm compositions in the presence of sub-MICs of rifampicin (polysaccharide and protein, respectively). The other strains, except for H1, produced polysaccharide biofilm in the presence of this drug. H1 isolate was not tested because it did not produce biofilm in medium with or without antibiotic. The presence of the ica locus was determined by multiplex PCR for the amplification of icaA and icaB genes, both essential for biofilm production in strains ica-dependent. These two genes were found in all strains studied. Fig. (4). Non-clinical isolates of S. aureus growing in modified CRA (without sucrose) [A] and modified CRA containing sub-MICs of rifampicin (0.002 or 0.004 µg/mL) [B]. Identification of the isolates: H01, H03, H39, H43 and H56. Biofilm negative: spots with smooth appearance. Biofilm positive: spots with rough appearance. Infections involving different types of implantable medical devices have been associated with bacteria embedded in biofilms, with S. epidermidis and S. aureus being among the most common etiologic agents of these infections [1, 8]. The staphylococcal biofilm expression is influenced by physical and chemical different factors, and it can be induced in response to external stress and sub-inhibitory concentrations of certain antibiotics [19-21]. Although this stimulation can be caused by low concentrations of antibiotics to sensitive or resistant bacteria [9, 22] we chose to investigate strains that were sensitive to the antimicrobials employed in the tests of biofilm production, i.e. rifampicin and minocycline. The results of the present study demonstrated that sub-MICs of rifampicin induced high biofilm formation in both clinical and non-clinical S. aureus strains. Among the seven isolates classified as biofilm non-producers in TSB medium, six had very high induction rates in the presence of the drug, with increase in OD595 values ranging from 890% to 1580% in non-clinical isolates and from 420% to 1030% in clinical ones in MIC /2 or MIC /4. In two of these isolates (H39 and C43) the stimulus was so potent that continued until the value of MIC/16. Besides, in strong producer H56 isolate sub-MICs of rifampicin almost doubled biofilm production levels. However, the induction effect was not observed in all isolates. The CA-MRSA strain maintained its phenotype of biofilm non-producer. Despite, in this isolate the ica operon was detected, as well as in all isolates, and it showed biofilm production when TSB was supplemented with 1.0% glucose (data not shown). Thus, this result indicates that this isolate has a stimulatory pathway of biofilm production that is not triggered by sub-MICs of rifampicin. The same explanation extends to C39 isolate, which did not change its weak producer phenotype in the presence of sub-MICs of rifampicin, but showed increased production (2x) in medium added with glucose (data not shown). Few studies have investigated the effect of rifampicin sub-MICs in biofilm formation in staphylococci and they have shown diversified results. Most of the studies, unlike our findings, indicate inhibitory effects on biofilm formation. Schadow et al. determined the adhesion properties of some strains of coagulase-negative staphylococci after treatment with sub-MICs of 14 antimicrobial agents. Compared with other agents investigated, rifampicin showed the greatest inhibitory effect in the adherence of S. epidermidis RP62A and RP12 strains. On the other hand, it caused an increase of 65% in adherence of strain RP14. Ozturk et al. showed that sub-MICs of rifampicin determined decrease of biofilm production in most of the strong biofilm producer MRSA strains, and increase in a few strains. In turn, Mirani et al. found no induction with rifampicin in biofilm formation in two MRSA isolates, one positive and one negative for icaA, on the contrary to what was observed for antibiotics active against cell wall. In contrast to the results obtained for rifampicin, minocycline sub-MICs did not induce biofilm production in isolates classified as non-producers. Unlike, in H56 isolate, and to a lesser extent in C39, biofilm expression was inhibited. The comparison of our results with those of other studies is difficult, because these studies have focused primarily on the efficacy of this drug, alone or in combination, to eradicate Staphylococcus in preformed biofilms [26, 27]. However, considering the reports of low levels of other ribosome-targeting drugs on biofilm formation by S. aureus, but minocycline, the data have shown essentially inhibitory effects or no effect: roxithromycin ; linezolid, tetracycline, erythromycin ; azithromycin . It is possible that the inhibition of biofilm production in S. aureus by sub-MICs of drugs with this mechanism of action be due to inhibition of the synthesis of proteins which are essential for the process of primary attachment in the first stage of biofilm formation, thus undermining the later stages. Nevertheless, for coagulase-negative staphylococci, in addition to reports of inhibitory effect or no effect on biofilm formation by drugs which acts by inhibiting protein synthesis, except minocycline [22, 30], there are also studies showing the stimulation of this expression . Analysing the results obtained with the combination of drugs in sub-MICs, we found that they were similar to those obtained with rifampicin alone. This suggests that the inducing stimulus for biofilm formation is mainly due to the action of rifampicin, and that this stimulus appears to supersede any eventual inhibitory effect of sub-MICs of minocycline in biofilm formation by the studied isolates. The chemical nature of the biofilm matrix was characterized as polysaccharide in all isolates that showed induction or increase in biofilm production by sub-MICs of rifampicin, and these results are consistent with the ica operon detected in these strains. Moreover, considering that these isolates were identified as methicillin-sensitive S. aureus, the results are in agreement with those obtained by McCarthy et al. . However, the weak producer C39 isolate, despite being positive for ica operon, showed no increase in the production of biofilm in the presence of rifampicin sub-MICs, and the chemical nature of its biofilm was proteinaceous in TSB with and without drug. Therefore, this isolate has a PIA-independent mechanism for the production of biofilm which is not affected by rifampicin, but that is stimulated by glucose as evidenced in additional experiment (data not shown). In addition to the biofilms formed by PIA and eventually extracellular DNA, it is now recognized that several staphylococcal proteins can also promote the accumulation phase in an ica-independent manner . Nevertheless, it is still not well established the type of matrix that can be produced in response to low concentrations of specific antimicrobials, and particularly if biofilm formation with protein matrix can be induced by sub-MICs of drugs such as rifampicin. A better knowledge of the chemical composition of the biofilms induced by different environmental conditions could be useful in the strategies for treatment of infections linked to the use of medical devices, since cells in biofilm with protein matrix have different organization of growing compared with those in PIA-dependent biofilm . The results of the modified CRA test were in accordance with the biofilm production determined in MTP assay, except for weak producer isolate C39 that had negative results (smooth appearance) in modified CRA, with and without rifampicin, and were positive for biofilm production in MTP assay. This difference of results may be due to the low sensitivity of CRA test to detect weak biofilm producers . Besides that, it should also be taken into account that the mechanism of positive reactions in CRA medium depends on polysaccharide biofilm production  and C39 isolate produced biofilm with protein composition. In the original CRA assay , the results are based on black or red colour, and rough or smooth consistency of the cultures. In modified CRA test, such as formulated in our study, the criterion for a positive result was based solely on the appearance of rough spots, and not in the black colour. The purpose of this change was to test the isolate in the absence of substances capable of inducing the production of biofilm, except those in study. Because of this, sucrose, which could generate hyperosmolarity conditions that induce biofilm production, was not added. Thus, the conditions of the test were closer to what was executed in the MTP assay. Despite the limited number of isolates tested, our results indicate that CRA without sucrose may be useful to evaluate the potential of sub-MICs of antibiotics, such as rifampicin, to stimulate the production of polysaccharide biofilm in the absence of other inducing substances. In summary, our data reveal that, in contrast to minocycline, rifampicin sub-MICs were able to induce intense biofilm formation by isolates of S. aureus. Therefore, the adoption of procedures to prevent the exposure of bacteria to sub-inhibitory concentrations of this antimicrobial in clinical practice can contribute to reduce the occurrence of biofilm-related infections caused by this microorganism. Additionally, in the case of prolonged use of intravascular or urinary catheters impregnated with rifampicin, it should be considered that the possibility that sub-inhibitory levels of the drug could favour colonization by this pathogen if it gains access to these devices during their stay in the patient. The authors are grateful to the Federal Hospital of the State Servers for providing the clinical isolates and Federal University of the State of Rio de Janeiro for supplied materials and laboratory equipment, besides two scholarships for undergraduate students. Otto M. How colonization factors are linked to outbreaks of methicillin-resistant Staphylococcus aureus: the roles of SasX and ACME. Biomol Concepts 2013; 4(5): 533-7. McCarthy H, Rudkin JK, Black NS, Gallagher L, O’Neill E, O’Gara JP. Methicillin resistance and the biofilm phenotype in Staphylococcus aureus. Front Cell Infect Microbiol 2015; 5: 1. Figueiredo AM, Ferreira FA, Beltrame CO, Côrtes MF. The role of biofilms in persistent infections and factors involved in ica-independent biofilm development and gene regulation in Staphylococcus aureus. Crit Rev Microbiol 2017; 41(3): 1-19. Speziale P, Pietrocola G, Foster TJ, Geoghegan JA. Protein-based biofilm matrices in Staphylococci. Front Cell Infect Microbiol 2014; 4: 171. Francolini I, Donelli G. Prevention and control of biofilm-based medical-device-related infections. FEMS Immunol Med Microbiol 2010; 59(3): 227-38. Aslam S, Darouiche RO. Prolonged bacterial exposure to minocycline/rifampicin-impregnated vascular catheters does not affect antimicrobial activity of catheters. J Antimicrob Chemother 2007; 60(1): 148-51. Yourassowsky E, van der Linden MP, Lismont MJ, Crokaert F. Combination of minocycline and rifampicin against methicillin- and gentamicin-resistant Staphylococcus aureus. J Clin Pathol 1981; 34(5): 559-63. Perlroth J, Kuo M, Tan J, Bayer AS, Miller LG. Adjunctive use of rifampin for the treatment of Staphylococcus aureus infections: a systematic review of the literature. Arch Intern Med 2008; 168(8): 805-19. Kaplan JB. Antibiotic-induced biofilm formation. Int J Artif Organs 2011; 34(9): 737-51. CLSI. Performance standards for antimicrobial susceptibility testing. Wayne, PA.: Clinical and Laboratory Standards Institute. 23rd informational supplement M100-S23; 2013. Stepanovic S, Vukovic D, Dakic I, Savic B, Svabic-Vlahovic M. A modified microtiter-plate test for quantification of staphylococcal biofilm formation. J Microbiol Methods 2000; 40(2): 175-9. Christensen GD, Simpson WA, Younger JJ, et al. Adherence of coagulase-negative staphylococci to plastic tissue culture plates: a quantitative model for the adherence of staphylococci to medical devices. J Clin Microbiol 1985; 22(6): 996-1006. Stepanović S, Vuković D, Hola V, et al. Quantification of biofilm in microtiter plates: overview of testing conditions and practical recommendations for assessment of biofilm production by staphylococci. APMIS 2007; 115(8): 891-9. Freeman DJ, Falkiner FR, Keane CT. New method for detecting slime production by coagulase negative staphylococci. J Clin Pathol 1989; 42(8): 872-4. Wang X, Preston JF III, Romeo T. The pgaABCD locus of Escherichia coli promotes the synthesis of a polysaccharide adhesin required for biofilm formation. J Bacteriol 2004; 186(9): 2724-34. Ninin E, Caroff N, Espaze E, et al. Assessment of ica operon carriage and biofilm production in Staphylococcus epidermidis isolates causing bacteraemia in bone marrow transplant recipients. Clin Microbiol Infect 2006; 12(5): 446-52. Eleaume H, Jabbouri S. Comparison of two standardisation methods in real-time quantitative RT-PCR to follow Staphylococcus aureus genes expression during in vitro growth. J Microbiol Methods 2004; 59(3): 363-70. Götz F. Staphylococcus and biofilms. Mol Microbiol 2002; 43(6): 1367-78. Rachid S, Ohlsen K, Witte W, Hacker J, Ziebuhr W. Effect of subinhibitory antibiotic concentrations on polysaccharide intercellular adhesin expression in biofilm-forming Staphylococcus epidermidis. Antimicrob Agents Chemother 2000; 44(12): 3357-63. Wang Q, Sun F-J, Liu Y, Xiong L-R, Xie L-L, Xia P-Y. Enhancement of biofilm formation by subinhibitory concentrations of macrolides in icaADBC-positive and -negative clinical isolates of Staphylococcus epidermidis. Antimicrob Agents Chemother 2010; 54(6): 2707-11. Schadow KH, Simpson WA, Christensen GD. Characteristics of adherence to plastic tissue culture plates of coagulase-negative staphylococci exposed to subinhibitory concentrations of antimicrobial agents. J Infect Dis 1988; 157(1): 71-7. Ozturk I, Yurtman AN, Erac B, Gul-Yurtsever S, Ermertcan S, Hosgor-Limoncu M. In vitro effect of moxifloxacin and rifampicin on biofilm formation by clinical MRSA isolates. Bratisl Lek Listy (Tlacene Vyd) 2014; 115(8): 483-6. Mirani ZA, Khan MN, Aziz M, Asadullah , Naz S, Khan SI. Effect of stress on biofilm formation by icaA positive and negative strains of methicillin resistant Staphylococcus aureus. J Coll Physicians Surg Pak 2012; 22(1): 10-4. Raad I, Chatzinikolaou I, Chaiban G, et al. In vitro and ex vivo activities of minocycline and EDTA against microorganisms embedded in biofilm on catheter surfaces. Antimicrob Agents Chemother 2003; 47(11): 3580-5. Claessens J, Roriz M, Merckx R, Baatsen P, Van Mellaert L, Van Eldere J. Inefficacy of vancomycin and teicoplanin in eradicating and killing Staphylococcus epidermidis biofilms in vitro. Int J Antimicrob Agents 2015; 45(4): 368-75. Haddadin RN, Saleh S, Al-Adham IS, Buultjens TE, Collier PJ. The effect of subminimal inhibitory concentrations of antibiotics on virulence factors expressed by Staphylococcus aureus biofilms. J Appl Microbiol 2010; 108(4): 1281-91. Gui Z, Wang H, Ding T, Zhu W, Zhuang X, Chu W. Azithromycin Reduces the Production of α-hemolysin and Biofilm Formation in Staphylococcus aureus. Indian J Microbiol 2014; 54(1): 114-7. Frank KL, Reichert EJ, Piper KE, Patel R. In vitro effects of antimicrobial agents on planktonic and biofilm forms of Staphylococcus lugdunensis clinical isolates. Antimicrob Agents Chemother 2007; 51(3): 888-95. Vergara-Irigaray M, Valle J, Merino N, et al. Relevant role of fibronectin-binding proteins in Staphylococcus aureus biofilm-associated foreign-body infections. Infect Immun 2009; 77(9): 3978-91. Zmantar T, Kouidhi B, Miladi H, Mahdouani K, Bakhrouf A. A microtiter plate assay for Staphylococcus aureus biofilm quantification at various pH levels and hydrogen peroxide supplementation. New Microbiol 2010; 33(2): 137-45.